Two wooden ornaments and the angel from the top of the tree. 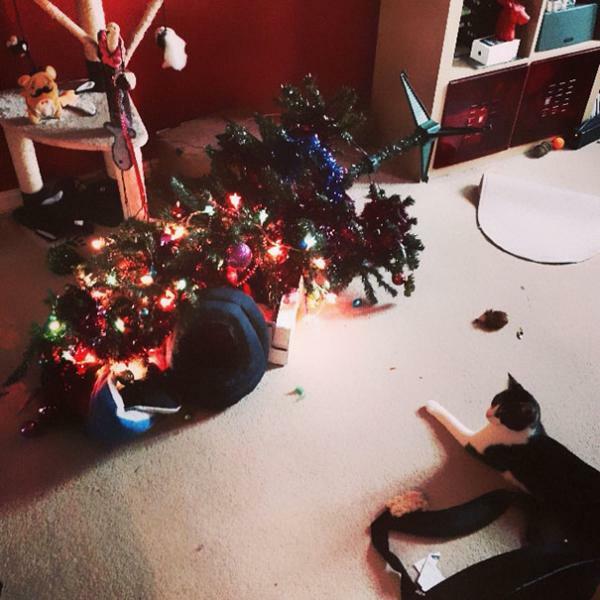 Three shredded presents, two wooden ornaments and the angel from the top of the tree. Four untied bows, three shredded presents, two wooden ornaments and the angel from the top of the tree. Fiiiiive glaaaaass baaaaalls, four untied bows, three shredded presents, two wooden ornaments and the angel from the top of the tree. Six plastic icicles, fiiiiive glaaaaass baaaaalls, four untied bows, three shredded presents, two wooden ornaments and the angel from the top of the tree. Seven broken lights, six plastic icicles, fiiiiive glaaaaass baaaaalls, four untied bows, three shredded presents, two wooden ornaments and the angel from the top of the tree. Eight clip-on birds, seven broken lights, six plastic icicles, fiiiiive glaaaaass baaaaalls, four untied bows, three shredded presents, two wooden ornaments and the angel from the top of the tree. Nine chewed up branches, eight clip-on birds, seven broken lights, six plastic icicles, fiiiiive glaaaaass baaaaalls, four untied bows, three shredded presents, two wooden ornaments and the angel from the top of the tree. Ten tattered stockings, nine chewed up branches, eight clip-on birds, seven broken lights, six plastic icicles, fiiiiive glaaaaass baaaaalls, four untied bows, three shredded presents, two wooden ornaments and the angel from the top of the tree. Eleven shiny tinsels, ten tattered stockings, nine chewed up branches, eight clip-on birds, seven broken lights, six plastic icicles, fiiiiive glaaaaass baaaaalls, four untied bows, three shredded presents, two wooden ornaments and the angel from the top of the tree. Twelve pools of vomit, eleven shiny tinsels, ten tattered stockings, nine chewed up branches, eight clip-on birds, seven broken lights, six plastic icicles, fiiiiive glaaaaass baaaaalls, four untied bows, three shredded presents, two wooden ornaments and the angel from the top of the tree. This is pretty cute, Marg.